Boutique winery 16 Mile Cellar is fast building a sterling reputation for artisanal wines that offer great value for the price. 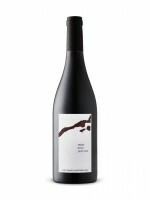 The 2014 Rebel Pinot Noir is produced from a mix of purchased grapes from the Beamsville Bench and the first crop from the estate (Susan's Vineyard) that borders King Street (aka Highway 8 or Regional Road 81 depending on your area code). Hand picked fruit gets the royal treatment from grapes to glass to yield a fragrant and satisfying medium-bodied Pinot Noir. There’s a pretty core of red fruit and a lifted earthy character that becomes more grounded after exposure to air. Drink now to 2022. Recommended. 350 cases.